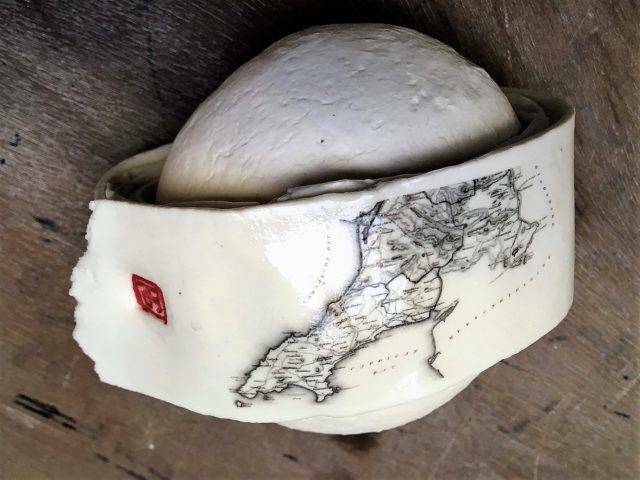 Working in porcelain, Ruth Gibson combines a love of photography, printmaking and ceramics, to evoke a sense of place; and in this exhibition the work is inspired by the landscape of the Llŷn Peninsula. Imagery includes winter trees, textures in nature, birds in flight, the rocks beneath the surface, and the inclusion of sections on map, rooting the work to the place it is inspired by. Ancient standing stones found scattered across this wild landscape are echoed in the shapes of the ceramic pieces. A fascination with the silhouette of the peninsula seen from afar is a theme that runs through this work. The repeated image of the outline, as well as shapes of the hills and the patterns of their contour lines found on maps, are incorporated into her designs. 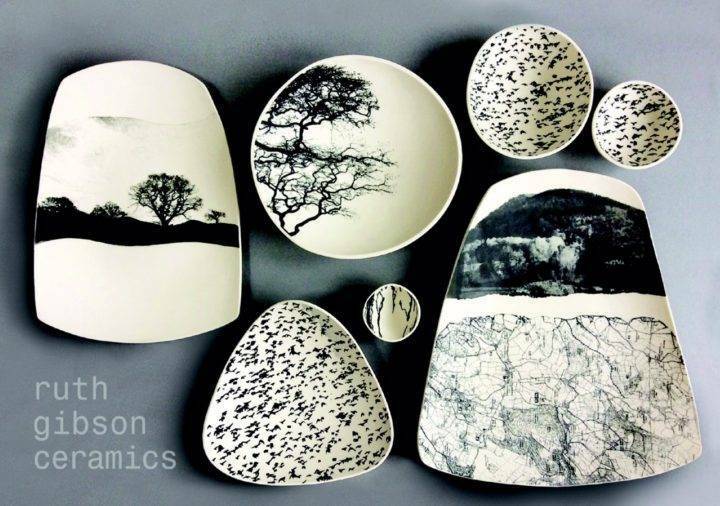 Utilising photography and ceramic printing techniques allows for photo realism to be combined with more abstract mark making to build up layers of images. Once screen-printed the clay can be stretched over moulds, the print can be distorted, or small sections can be added or removed to create abstract patterns. The work is enhanced by the addition of glazes and local clays used in a painterly style. Through these artworks, Ruth is interested in conveying the peace and contemplative qualities which one can experience when immersed in the natural environment. 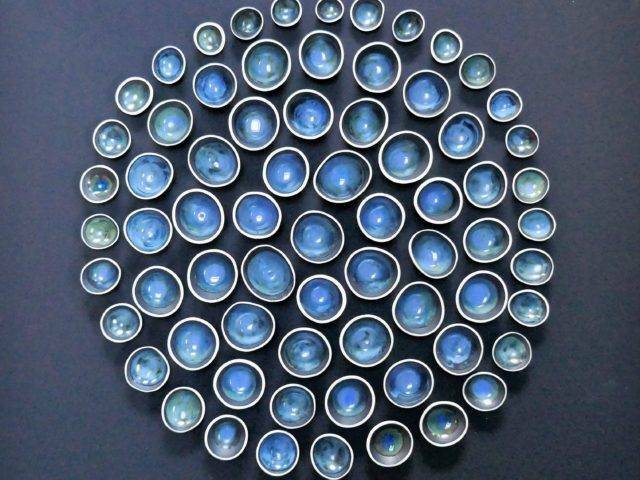 She seeks to enhance the qualities of porcelain and to reflect nature; the whiteness of a perfectly round pebble, the seemingly scratched patterns found in stones and the smoothness of sea-worn shells inform the design and surface quality. The gathering and sorting of found objects, stones in particular, has been a life-long obsession! Whilst researching for this project, it has been a delight for Ruth to discover that her father, a poet, has written poems about this locality and that he had a similar fascination for the outline of the hills. 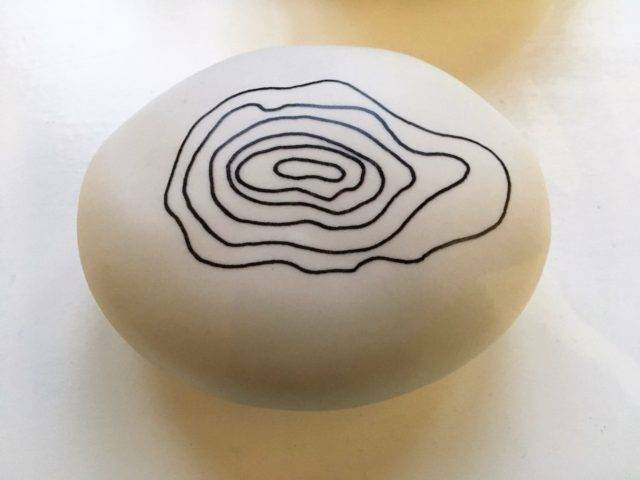 Ruth has focused on one poem in particular describing the shape of the hills, which appears here on a porcelain rock and in a sound piece. There is a play between 2D and 3D in some of the work, where flat images are printed on curved surface or a small three dimensional stones may carry a distant view. 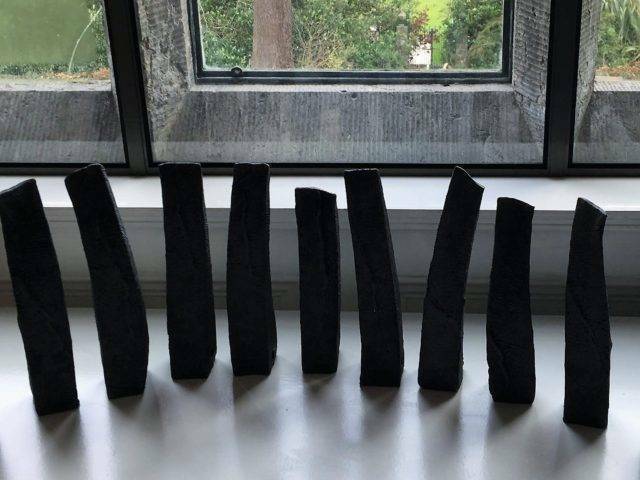 Stones have been utilised as canvases for the work. At Porth Dinllaen on the north coast, the cliffs are prone to landslides and in the winter clay is exposed on the beach. Ruth has worked with this clay directly on the beach as well as gathering it to be incorporated into her work. This exhibition has prompted much exploration of this locally found clay, and more experimental work, exploring the possibilities of the clay (kiln failures not exhibited ! )The found clay worked particularly well as a slip and a glaze, and features in a number of pieces here. It fires to a rich dark glassy brown colour at high temperatures. Painting the landscape with clay from beneath the earth deepens the connection between artwork and material. 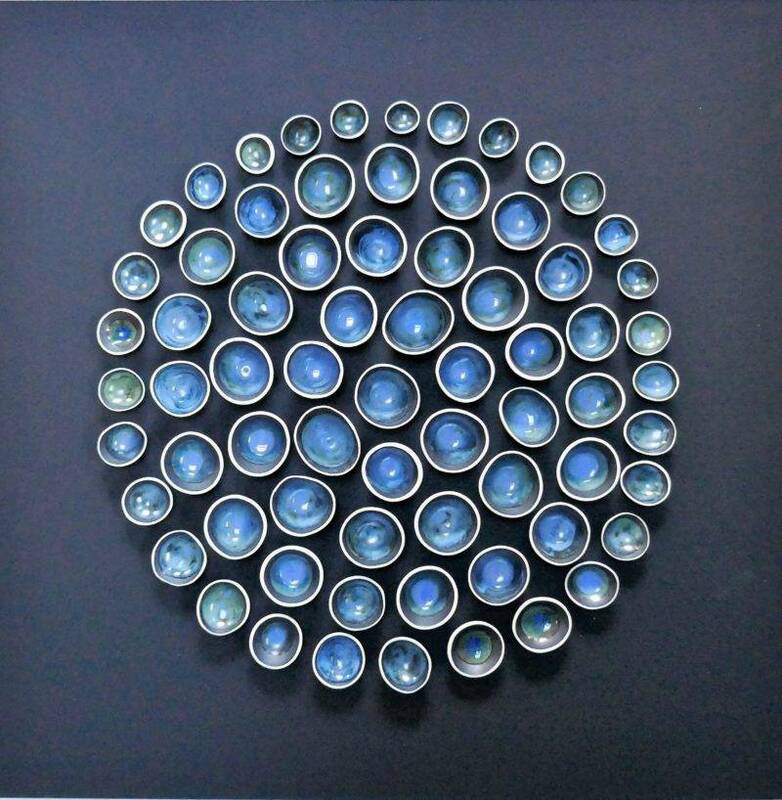 Ruth has always been interested in large-scale ceramics, and her compositions are built up of multiple ceramic pieces, to achieve ceramic wall art on a bigger scale. This exhibition features her largest wall pieces made to date. Creating work for this exhibition has been a mammoth task; Ruth’s largest body of work to be seen in one place. 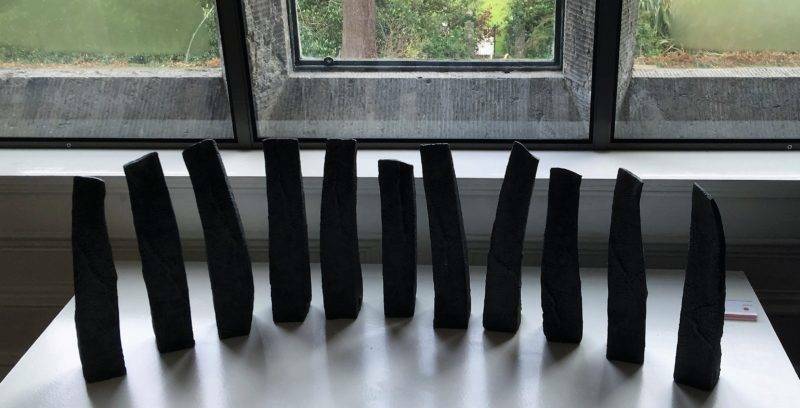 "Screen-printed and glazed ceramic artworks utilising photography and ceramic printing techniques; allowing for photo realism combined with more abstract mark making to build up layers of images."